IDF Intelligence HQ Tag. Typically, each IDF unit (yehida) has its own shoulder tag. 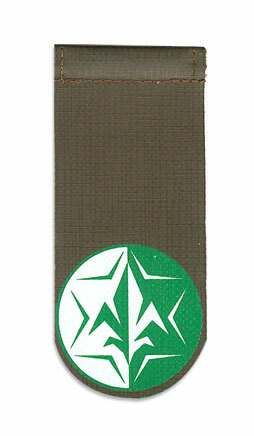 Shoulder tags consist of a long section and a tip, which can be one of four shapes: a circle (commands, directorates and air force units except anti-aircraft), a square (Golani Brigade), a diamond, or a shield-like shape (most common). The Directorate of Military Intelligence is Israel's central, overarching military intelligence, in the Israel Defense Forces. Aman was created in 1950, when the Intelligence Department was spun off from the IDF's General Staff (then, Agam: ав"н); the Intelligence Department itself was composed largely of former members of the Haganah Intelligence Service (HIS). Aman is an independent service, and not part of the ground forces, navy or the Israeli Air Force. It has a staff of 7,000 personnel (1996 estimate). It is currently headed by Major General (in Hebrew: Aluf) Amos Yadlin.